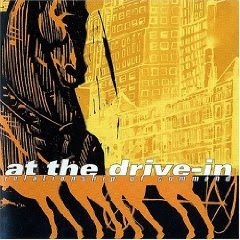 Stay Right Here a Little While...: AT THE DRIVE-IN: "Relationship of Command"
At the Drive-In's "Relationship of Command"(2000). This is the only album I have by this band. I have only heard a small amount of their other material, but this album is constantly finding it's way into my CD player somehow. At the Drive-In are a highly emotive mix of punk and prog-metal. They sound like a strange marriage between a revved up Fugazi and the, heavy, progressive, sci-fi metal of Voivod. The vocals alternate between quiet and contemplative and outright ferocious, and the music is fast, heavy, complex, and dizzying. It is all held together by underlying sense of melody and highly infectious choruses. Combined with askewed, bizzare lyrics and the unrelenting pace and disorienting feel of the music, you feel overwhelmed and exhausted by the end of the album, yet you can't get the songs out of your head and you want to come back for more. Some of my favorite tracks are "Arcarsenal", "Sleepwalk Capsules", "Cosmonaut", and "One-Armed Scissor". Highly recommended. Here's the video to "One Armed Scissor" and a live performance of "Cosmonaut". Enjoy! Yeah those cats aren't so bad.